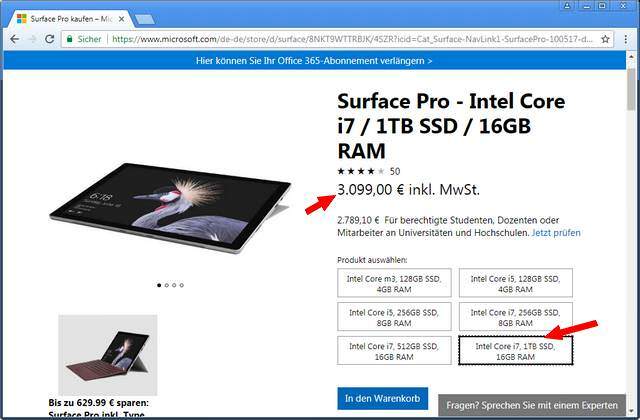 [German]It’s a rather strange story: The Surface Pro (2017) model with 1 terabyte SSD memory will be shipped with two SSD modules of 512 GByte each. This may results in irritation if the user wipes the SSD during reinstallation or have a closer look at Windows 10’s defragmenting. Microsoft offers the Surface Pro (2017) in various configurations regarding the SSD size. On the website you can also order a model with 1 Terabyte SSD. Woody Leonhard has addressed it at Computerworld: The 1 TB model will be shipped with two 512 GByte SSDs ausgeliefert (Surface Pro 4 has one 1 TB SSD). Woody suppose that this saves Microsoft a manufacturing costs, since 1 TByte SSDs are more expensive than two 512 GByte SSDs. But I was told (from a MS partner), that the reason for the two 512 GB SSD was different. The problem is that there are no single chips of this size, and a separate controller would have required additional space and power. The 2017 Surface Pro soldered the two chips to the board to the PCI bus, so they are not real SSDs. The Pro4 has an NVME SSD in the sense that there is a controller between the two chips, which connects to the PCIe bus. This controller has been dropped in Surface Pro 2017, the tasks of the controller are now taken over by Windows. So now we have the explanation: There was no room for a controller, so Windows 10 has to do the work. This seems to work from Windows 10 V1703 upwards. The proof, that there are two SSDs are used, is delivered by a screenshot posted within this Microsoft Answers forum thread. The two SSDs are configured in the Surface as storage space drives with a capacity of 1 GByte (net 952 GB). All in all, the buyer gets his 1TB SSD capacity, even if the Microsoft Store page doesn’t mention anything about two 512 GByte SSDs (I didn’t find anything). Is it a good idea, to omit a controller, that can combine two SSDs to on logical module? Letting Windows 10 do the job, may lead to some issues and irritations. Problem 1: Defragmenting a SSD? At Microsoft Answers there is this forum thread, where a user with a 1 TB Surface Pro 2017 model came out and reported issues. I have a new Surface Pro with a 1TB drive. Teh drive is actually two 512GB in a 1TB storage space (like RAID 0). I see Drive Optimization is on to run weekly. I have read that defrag of SSD is not needed. Should this be turned off? 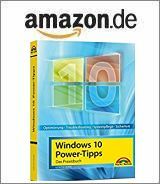 By default, Optimize Drives, previously called Disk Defragmenter, runs automatically on a weekly schedule at the time set in automatic maintenance. 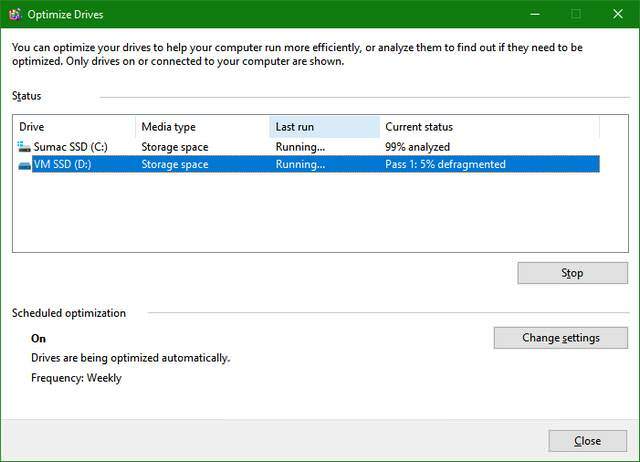 Windows 10 can identify the proper optimization for different types of storage devices. Once Windows 10 recognizes the SSD, it will perform TRIM. It’s a command that informs a solid-state drive (SSD) which file space are no longer in use and can be wiped. This helps improve your SSD’s performance. So, we suggest that you leave it on. While I appreciate having a software RAID 0 on a tablet this size, its ridiculous that Microsoft’s own software does *not* recognize underlying SSD hardware and cannot TRIM the storage, instead running a defrag operation when I try to optimize. I figure the Surface Pro 4 1 TB had a single 1 TB device in it. This one has two 512 TB devices, which probably save Microsoft some money. It would have been nicer, of course, had they released a 2 TB model of the device – or even 4 TB, as you already have 2 TB M2 form factor drives, and you could combine those for a total of 4 TB storage on a 12″ tablet! That would have been something. The 1st through 3rd generation SSD/eMMc (flash) chips did have an issue in defrag but the current chips on the market are refined and do not have a problem. You should not have to worry about fragmentation. Unlike a hard disk, when a defrag is performed, the data is lifted off the storage and re-written and the blank space is formatted (TRIM, if you will). It does shorted the life span if you perform it but these machines do not last long enough to reach ‚end of life‘. I wouldn’t worry about it. Even fragmented, the I/O speed is so fast, you can’t tell the difference even if the storage is full. Disable any defrag schedule from the defrag app GUI because Microsoft will otherwise burn your SSD a little bit every week on schedule. Remember, perseverance always pays off!!! Run defrag.exe from the command line with the /l parameter to force a trim. So, for example, defrag c: /l. This *seems* to work. This is contrary to the above statements regarding defragmentation. Whether this is true or not I cannot make a definitive judgement. As we are finding out, the Surface Pro (2017) with 1 TB configuration comes with two separate 512 GB hard drives. 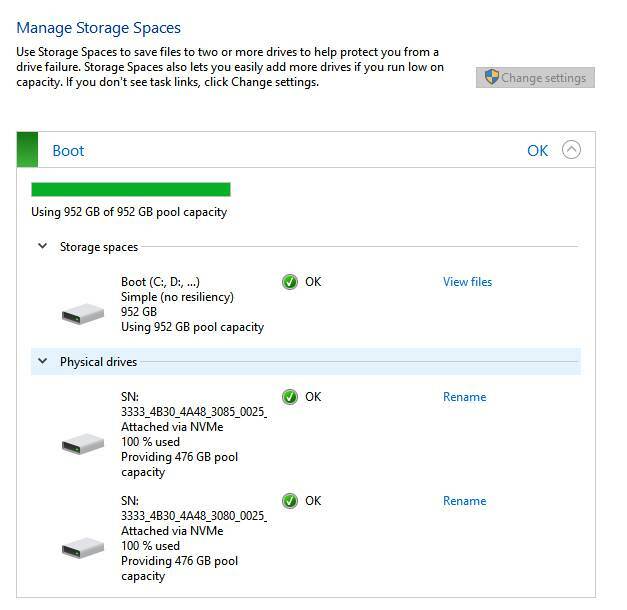 Microsoft uses Storage Spaces to combine them to 1 drive. During testing, I have wiped the hard drives and the Storage Spaces configuration is lost. After re-installing Windows 10, I now have 2 separate 512 GB hard drives. I need to combine the two to be shown as a single 1 TB drive again like how it was out of the box. I am unable to create a Storage Space drive within Windows to include the boot drive. It appears it needs to be done before Windows is installed. How do we manually re-create this? MVP colleague Barb Bowman found the solution to this problem through her Microsoft’s internal contacts. I was informed that the new release of the Surface Data eraser can put the drives back together. Download from here. Create a USB drive, boot from it, and run it. It will put the drives back together and then you can use the downloadable recovery image from here to reimage the drive. Woody Leonhard mentioned it here: You can’t use Symantec Endpoint Protection on such a machine. The reason: Symantec Endpoint Protection (SEP) client cannot be installed to storage space drive. This entry was posted in devices and tagged Surface Pro 2017. Bookmark the permalink.